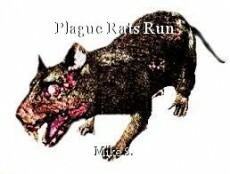 Plague Rats Run, poem by Mike S.
screaming out a backlash, and their rage. always there, hidden racists at their core. with their focus on 'me' and on gaining possessions. just the white, see the plague rats run. Echoing greed, and what's in it for me? Turning hope into despair, and at light speed. they slithered from the darkness of primordial ooze. just feverish scampering in their short-sighted maze. Thanks as always, J. B!